When branching out of its own particular niche, Apple tends to cozy up to high-end manufacturers within the new industry it’s trying to capture. Nike, for example, has been a key partner in the Cupertino’s various fitness-related enterprises, and with CarPlay now at the fore, Apple marketing lead Greg Joswiak has been at the Geneva Motor Show discussing a tie-in with Italian supercar maker Ferrari. 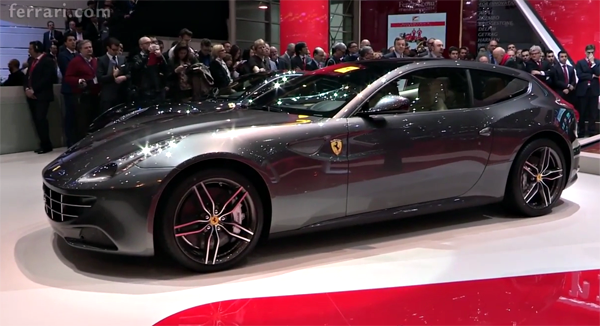 Joining Ferrari chairman Luca Cordero di Montezemolo on stage, the pair showcased CarPlay integration in the revamped four-seater Ferrari FF grand tourer. We’ve already seen the walkthrough videos of Volvo and Mercedes-Benz – the other two members of Apple’s CarPlay launch trifecta – but the collaboration with Ferrari is, for obvious reasons, being treated as the marquee partnership as the fruit company goes all-out in promoting and marketing its in-car product. Speaking of the product, Joswiak has noted that CarPlay has been developed "from the ground up" in order to offer drivers an "incredible," iPhone-based driving experience with "minimized distraction." "We have an amazing line up of auto partners rolling out CarPlay," he said earlier on this week, "and we’re thrilled it will make its debut this week in Geneva." The FF grand tourer, which packs 651 brake horsepower, is also Ferrari’s first all-wheel-drive sports car, so for geeks and petrol-heads alike, this car definitely has something new to offer. If you don’t quite have the wad for a new Ferrari, then don’t fret, for several key auto manufacturers have hopped aboard the CarPlay bandwagon. As well as Volvo and Mercedes-Benz, both of whom have shown-off their CarPlay tech with demonstration videos during the past few hours, the likes of Chevrolet and Honda have also been working on integration, so if your budget doesn’t stretch to the new FF, then you can still get your fix of the new in-car iOS experience some other way. 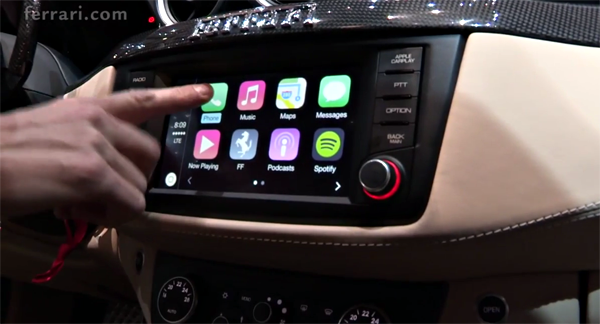 In many respects, CarPlay functions like AirPlay, in that it offers a simple, tailored way for content to be viewed on a more convenient display. As well as improving upon functionality, the potential safety benefits could spare the lives of thousands each year, and from a business point of view, purchasers of CarPlay-ready cars will be essentially tied down to the iOS ecosystem.